Having goals is fundamental to success in any personal, professional and academic area in your life. We have variety of goals in our lives whether it is achieving a specific SAT score, getting into a college of our choice, starting a competitive sport, being able to lift heaver weights or being able to run a 5K. Similarly, we have professional goals of being able to land a job, be promoted within the job, buying a house, car or any personal items that we may wish to have in our lives. Similar to having personal and professional goals, it is important to also have financial goals that align with your lifestyle and family. And more importantly the key is to track your progress towards financial goals. One way of tracking financial progress is to maintain a view of your net worth and update it frequently – monthly or quarterly is preferred. Have a goal for your net worth so you are constantly working towards it by employing sound financial habits and investments. 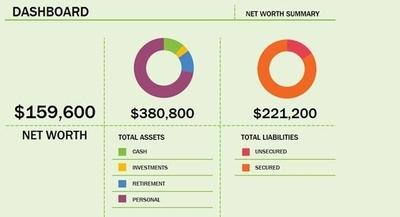 The process of measuring net worth can help you identify areas that needs attention and also areas that are working well, helping you make and accelerate decisions that improve your financial health. Measuring progress and reviewing your net worth is imperative to personal financial success as it helps you stay motivated and keeps a check on financial progress.